Exchange administrators usually do not have to interact directly with the EDB storage folders unless they need to restore data or create a backup. So, it won’t come as a surprise if you don’t know the default location of your EDB files. In fact, the default location of Exchange Database Files varies from one version to another. And if you know the location of EDB files, it will be easier for you to fix Exchange related issues and errors, especially when you are using inbuilt features to fix EDB corruption. Where you can find EDB files? Once you know the location of EDB files, you can move, backup, migrate, recover or delete them as per your requirement using their respective procedures. Also, most of the Exchange recovery tools have inbuilt search facilities to locate the EDB files. Tools like Kernel for Exchange Server can be used even if you don’t know the location of the EDB file. Summary: EDB file location is different in different versions of Exchange. To handle EDB corruption using inbuilt features, you may need to know the exact location of these files. But third-party EDB to PST tools like Kernel for Exchange Server have the facility to search and locate EDB files. How to Resolve Exchange Error 'Unable to Mount Database'? 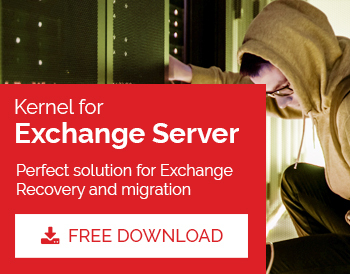 How to Configure Maintenance Schedule of Exchange Mailbox? How to Migrate Exchange Mailboxes to Office 365? How to Reduce EDB File Size?